Hello and welcome to Australia Day. Perhaps I should be showing something from Australia but I have been looking at GB Regionals again and thought I would keep with that theme. In a recent piece I wrote about the redrawn eye of the dragon on a GB Wales regional stamp. I commented about the catalogue price difference and how important I think it is to know about these differences and check for them. Continuing this theme let’s look at this stamp from Northern Ireland. 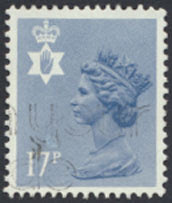 SG NI 43, the 17p grey blue on phosphorised paper issued in 1984. I was not aware there were two types to this stamp. But as I was checking I found both Types in my stock. Try as I might I cannot get a scan of the differences from the actual stamps so am using the image from the SG Concise catalogue. see image below - Type one shown to the left has the crown with all the pearls individually drawn, that is they are not touching, while Type II - issued in 1986 and SG NI 43Ea - has the first three pearls on the left of the crown joined. There are a few other differences to look for but this one is very clearly seen with a good magnifying glass. All very nice I hear you say again. Even nicer when you see the catalogue prices of the Type II stamp is £150 versus £0.80 for the Type I issue. Check your stamps. Perhaps you have a gap in your collection :-) or something of higher value than you realised.